Stone sculpture to commemorate 25 year exchange. 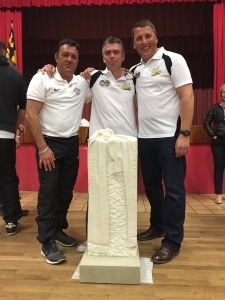 I was honoured to be asked to create a stone sculpture to commemorate the 25 year exchange between Castle Donington Football Club in Leicestershire and Union Sportive de Gasny in Northern France. The two towns have been running the exchange visit since 1991 and last week saw 56 adults and children travel to the small French Town to celebrate the anniversary and to take part in the annual football tournament. One month earlier, over 100 French had enjoyed their leg of the exchange. Whilst in Castle Donington, I took the opportunity to engage them in the first part of creating the stone sculpture. Everyone involved in the exchange was given the chance to carry out a small amount of carving onto the back of the sculpture. The carvings ranged from initials, dates and small images to names of their favourite football teams. While the French returned home, I began work transforming the Portland Limestone block into a completed stone sculpture to take back over the channel. The finished piece featured 2 football scarves, tied in a knot and draped over the stone. Each scarf, etched with the names of Castle Donington FC and Gasny. The carvings on the back by both the English and the French were left, celebrating the successful union between the 2 football clubs. The stone sculpture was unveiled during a ceremony to conclude the 4 day visit to Gasny last weekend. Everyone seemed delighted with the sculpture and even more thrilled when they realised that the carvings that they carried out in England had been preserved on the back of the stone. the image shows me sandwiched between the Chairmen of the 2 clubs. The stone will be erected outside of the stadium in Gasny where it will hopefully be viewed by many more people enjoying the exchange for decades to come.